If you haven't seen this movie and you are a horror movie fan or just into some seriously dark comedy be prepared! This movie takes gore to an over the top extreme. 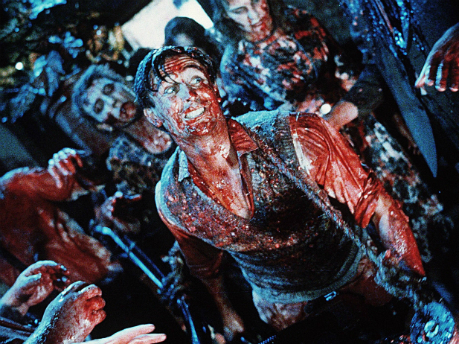 Often cited as the most gory movie of all time Peter Jackson's (yes that Peter Jackson) Braindead aka Dead Alive in some locations is a darkly comic tour de force. Based on an overprotective mother who gets bitten by a Sumatran Rat Monkey in a zoo and then slowly transforms into a horrific zombie monster. Lionel her son meanwhile has to juggle a budding relationship with a local girl, his mothers failing health and a soon to be house full of zombies. Not to mention his lecherous old uncle who wants the family fortune. Enjoy!